Still figuring out what to get your family, friends and coworkers? There is an abundance of suggestions on the internet. I've even seen a few catered to specific people like 'gym fanatics' or 'women over 50'. No matter who is left on your 'Nice' list, Russo Fab here with 5 gift ideas for all of the people in your life to enjoy! All that is required is a little water, little bit of sunshine and some love. Lets dig in.. This is brilliant for anybody who enjoys cooking or an aspiring home chef. You can find inexpensive, assorted herb plants at your local grocery store or garden center year round. Drop them in a large container, or in separate pots. Terra cotta, mason jars and empty metal soup cans are household pieces that make great, trendy planters. Everyone has a soft spot for these babies! Many home and furnishing stores sell artificial plants that are such great quality even I have to do a double take. These make a perfect gift, but why not try the real thing! They are insanely easy to care for: a sunny spot and an occasional shot of water. Succulents grow in hundreds of different varieties, in a range of colors and sizes, so you are bound to find the one for someone special! Men, women and children alike enjoy watching these adorable pants grow! You can find some at your local garden center or home improvement store. For more unique varieties, I suggest contacting local florist shops in your area. Yep. Threw that in the mix! Instead of flowers, my mother has always given these plants as gifts. Growing up I thought she was insane- "Mum, I am a florist! Let me make something nice for your friends!" but she persisted. And I understand why. These are by far the EASIEST plants to take care of. Even for the person that jokes they can't keep anything alive. Trust me. These plants look great in any spot in the house. They'll begin to trail over time which is an elegant look. Not a fan of hanging plants? Cut them back. Pothos will essentially last forever. Give the gift of green this holiday season! Because you can never go wrong with fresh flowers! 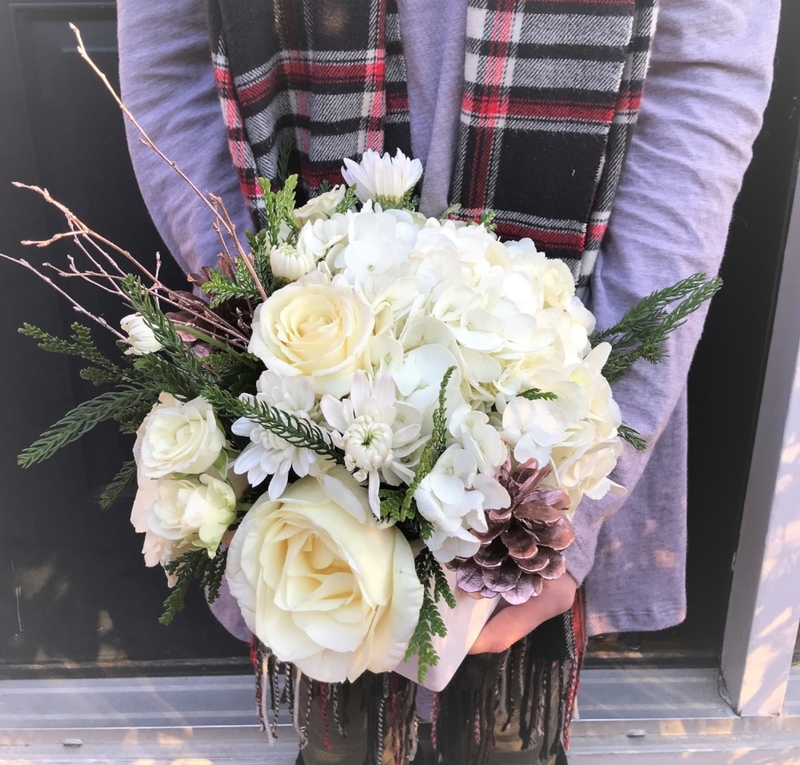 Using the freshest seasonal product, 'Winter Elegance' is long lasting flower arrangement guaranteed to make anyone smile. We're offering complimentary gift wrap with every order and free delivery in the South Shore and Boston area! Did you get that? WE WILL DELIVER IT FOR YOU! That means you can stay snuggled up at home with some cocoa or focus on baking the perfect Christmas cookies. We are accepting orders until 12/18 and will be delivering 12/21-12/23. Check out more information here! Don't be intimidated by the elegance and beauty of these luxurious plants! Available year round and found in various locations from grocery stores to high end florist shops, orchids are long lasting and elegant making them the perfect gift. Orchids come in many colors and tons of unique varieties. The popular and most common, Phalaenopsis orchid, requires easy care. These orchids will thrive with indirect light and a watering once a week. Wow your host/hostess this holiday with the gift of an orchid! Spread the love and give the gift of living plants! Whether you choose one of these unique ideas from our Fab Gift Guide or stick with a nice bottle of champagne- it's the thought that counts! Don't forget to give back to those less fortunate too. Stay fabulous!